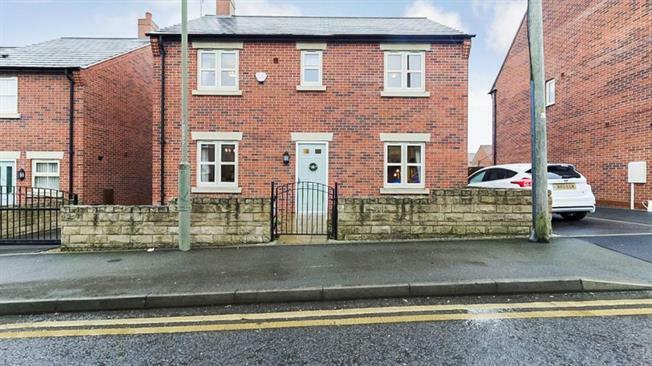 4 Bedroom Detached House For Sale in Chesterfield for Guide Price £230,000. Blundells are proud to present this beautiful four bedroom detached home situated in the heart of Clowne. Downstairs the property boats a large kitchen diner with separate utility room. The kitchen has white high gloss wall and base units with wooden effect work surfaces. There is a large dual aspect living room and downstairs WC. All neutrally decorated and ready to move in. Upstairs the property boasts four bedrooms, three doubles and a single. The master bedroom has a large en-suite shower room, with low level flush, wash hand basin and double shower tray. The master, second and fourth bedrooms have built in storage. There is a family bathroom, complete with white three piece suite, low level flush, wash hand basin and bath. Outside is a beautifully landscaped garden, ideal for the family and the coming summer and a detached garage with electric and lighting which can be found via a private driveway which can house 3 cars. Clowne is a small residential village and only 9 miles north east of Chesterfield and 7 miles south west of Worksop and only minutes from the M1 motorway. The village has a host of local amenities such as a large Wilkinson's store and Tesco Supermarket, public houses, local shops and post office, along with The Springs Health Centre and the Clowne Dental Practice within walking distance.